Chesterton has been called the Prince of Paradox. His works include journalism, philosophy, poetry, biography, fantasy and detective stories. Chesterton has great fun satirizing the Victorian sleuths such as Sherlock Holmes . These 39 tales will delight the reader. Chesterton said that these stories just came to him like sitting still and letting them light on him like flies. Some of these tales are just for fun while other are filled with good common sense. Gilbert Keith Chesterton (1874-1936) was an English literary and social critic, historian, playwright, poet, Catholic theologian, debater, mystery writer and foremost, a novelist. Among the primary achievements of Chesterton's extensive writing career are the wide range of subjects written about, the large number of genres employed, and the sheer volume of publications produced. He wrote several plays, around 80 books, several hundred poems, some 200 short stories and 4000 essays. Chesterton's writings without fail displayed wit and a sense of humor by incorporating paradox, yet still making serious comments on the world, government, politics, economics, theology, philosophy and many other topics. 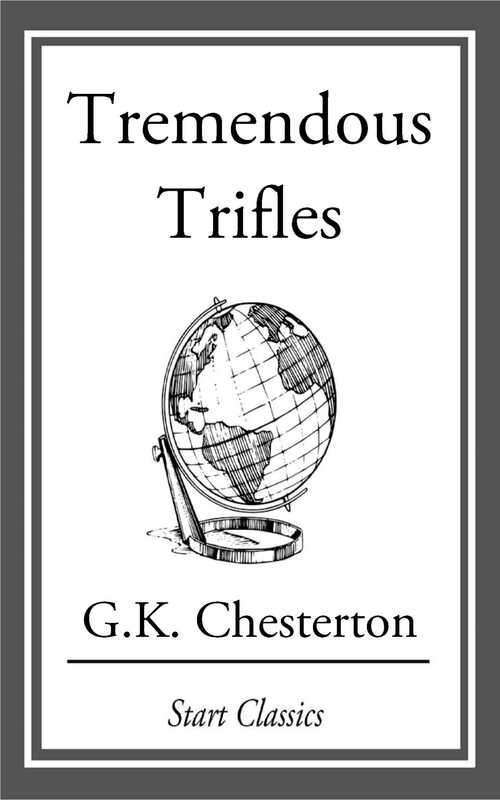 Chesterton uses his compilation of essays in Tremendous Trifles as a guide to reflect on everyday life. Among this collection: A Piece of Chalk -where a drawing exercise turns into a lesson on the nature of truth, Twelve Men -an explanation on why we have juries made of our peers and not professional jurors, The Dragon's Grandmother -on why we should read fairy tales to our children along with many more endearing reflections.